The TAG Heuer Grand Carrera timepieces all feature a distinctive style inspired by race car engine design paired with elegant materials. The TAG Heuer Grand Carrera Watch CAV511E.FC6231 features a chocolate brown face that creates a uniformity in style mirrored by the alligator band. The TAG Heuer Grand Carrera Watch CAV511E.FC6231 features fine-brushed, polished steel in the bezel and case with a brown alligator band and a textured brown dial. It features a tachymeter scale on the bezel that measure average speeds. It also has a date display at 6 o’clock, permanent seconds at 3, and chrono minutes at 9 o’clock. These features make it a high caliber chronometer that warrants its certification and appeal to connoisseurs. The style of the watch is very attractive with its brown dial that is evocative of deep mahogany and is complemented by the brown alligator strap. 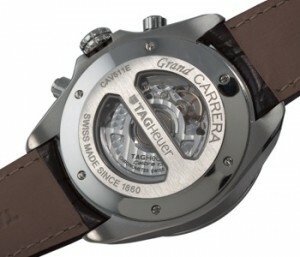 The back of the watch also has an anti-scratch sapphire crystal window that reveals the movement. 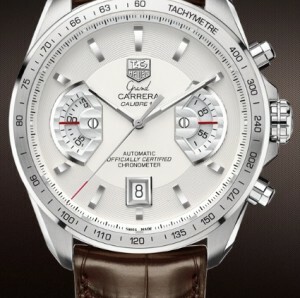 The other Grand Carrera timepieces all have the same layout and features, so the color scheme and materials are the only variations among the different models. There is a model, CAV511AB.A0902, with a black dial and steel bracelet, which has a much more classic look that doesn’t separate itself from other watches in the way that the other Carerra watches do with the continuity in dial color and alligator strap. The model with a white dial, CAV511B.FC6231, doesn’t emphasize the unique layout and shape of the chrono features the way the others do with the contrast between the white chronos and colored backgrounds. TAG Heuer initially created chronographs for automobiles and aircrafts and moved into sports timing. The Grand Carrera line is an elegant collection of high-end timepieces with advanced chronograph capabilities uniquely set into a beautifully crafted case. The TAG Heuer Grand Carrera Watch CAV511E.FC6231 reveals its luxurious sophistication in its materials and color scheme while also highlighting its advanced and functional chrono features with their polished steel contrasting with the chocolate brown of the dial and strap. This is a very expensive investment in a timepiece, but it is made with scrupulous attention to detail and top quality materials to guarantee a debonair and precise watch and accessory.